After the Lord Mayor’s show comes the dustcart. After our blissful, long-awaited day of uninterrupted sun came the grey and rain, again, as advertised. This is so frustrating – we know how delightful Spain can be, even in winter, but our two weeks in February are turning out to be irritatingly atypical. Even the almond trees appear to have put life on hold and stand apparently dormant in various stages of blossoming. Chris told us that there are 15 types of almond tree, each with a different shade of white or pink. We’re ready with our cameras but nature isn’t playing. Still, given the torrential disaster in Madeira, we have little to complain about. The rain began at about 11:00 AM. Shortly after, we bad fond farewells to Chris, Yvonne and el perrito, Scamp, before driving the measly mile to the other side of the valley via the bodega to get a refilled 5 litre flagon (just over an imperial gallon) of rosado. I still can’t believe this stuff; at 90¢ a litre, it’s cheaper than bottled water. Brilliant! We were soon at Geoff and Pam’s renewing acquaintances with the three remaining pets. Sadly, in the year since we were house-and-pet sitting, they have lost one dog and one cat to the ravages of old age. One of our first services was to get Geoff’s new (second-hand) laptop and wireless router talking to each other. I discovered a reset button which made the wireless LAN burst into life and Carol discovered the security key which the laptop needed to be allowed access. What teamwork! Everyone was happy – now we’d have a week of wireless access without resorting to McDonald’s. Domesticated life and PC support services aside, wildlife once again produced some elevated interest. While we were unpacking and settling in to our new bedroom, Carol returned from the bathroom excitedly announcing that she had something I should see. Well, how could a boy contain himself? The source of the excitement turned out to be an attractively marked creepy-crawly lurking on the tiles in our bathroom. It was about 2.5cms/1in long and completely new to me. With a lot of close-focus rings and a spot of flash, I snapped it. With Geoff’s super newly activated wi-fi, I posted our unknown invertebrate on iSpot. 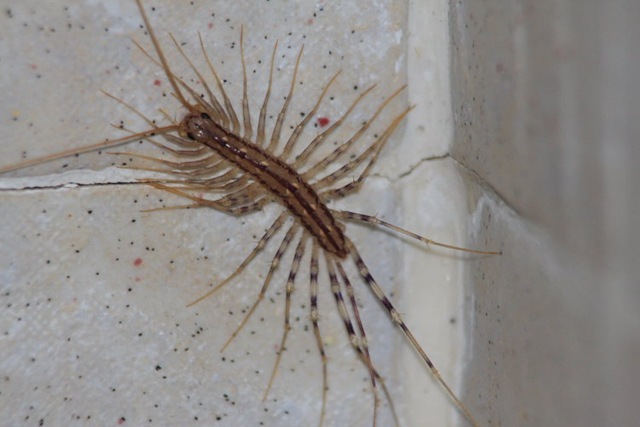 My leggy creepy-crawly turns out to be a House Centipede (Scutigera coleoptrata). I love iSpot. Given Internet access, it seems to beat any field guide. Articles on the Internet say that House Centipedes are very common round the Mediterranean area. They have 15 pairs of legs, in which case I think House Trentipedes might be a more appropriate name … but whose counting? It’s certainly an interesting critter to add to my insect collection. Given the weather, we’re finding precious little else to train our cameras on.